Wave intensity (WI) is a novel hemodynamic index, which is defined as (dP/dt)·(dU/dt) at any site of the circulation, where dP/dt and dU/dt are the derivatives of blood pressure and velocity with respect to time, respectively. However, the pathophysiological meanings of this index have not been fully elucidated in the clinical setting. Accordingly, we investigated this issue in 64 patients who underwent invasive evaluation of left ventricular (LV) function. WI was obtained at the right carotid artery using a color Doppler system for blood velocity measurement combined with an echo-tracking method for detecting vessel diameter changes. 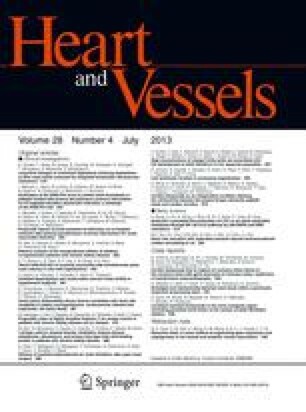 The vessel diameter changes were automatically converted to pressure waveforms by calibrating its peak and minimum values by systolic and diastolic brachial blood pressures. The WI of the patients showed two sharp positive peaks. The first peak was found at the very early phase of LV ejection, while the second peak was observed near end-ejection. The magnitude of the first peak of WI significantly correlated with the maximum rate of LV pressure rise (LV max. dP/dt) (r = 0.74, P ≪ 0.001). The amplitude of the second peak of WI significantly correlated with the time constant of LV relaxation (r = −0.77, P ≪ 0.001). The amplitude of the second peak was significantly greater in patients with the inertia force of late systolic aortic flow than in those without the inertia force (3 080 ± 1 741 vs 1 890 ± 1 291 mmHg m s−3, P ≪ 0.01). These findings demonstrate that the magnitude of the first peak of WI reflects LV contractile performance, and the amplitude of the second peak of WI is determined by LV behavior during the period from late systole to isovolumic relaxation. WI is a noninvasively obtained, clinically useful parameter for the evaluation of LV systolic and early diastolic performance at the same time.